Cognex Corporation (NASDAQ: CGNX) today announced the industry-leading DataMan® DPM reading technology is now available on a mobile computer. The DataMan 9500 industrial-grade mobile computer is ideal for reading challenging DPM (direct part mark) codes in applications where operators need to view the code data on an integrated handheld device. The DataMan 9500 provides unmatched DPM code reading performance, direct connectivity to factory networks via Wi-Fi and an integrated GUI. "In applications like subassembly rework, repair or maintenance, inventory management or process tracking, it's necessary to be able to read 2-D codes and get real-time feedback to the operator on the factory floor," said Carl Gerst, Business Unit Manager for ID Products. "Now, with the DataMan 9500, even the most challenging DPM codes can be read and transferred to the factory network via Wi-Fi for real-time data collection. The DataMan 9500 expands the types of applications where 2-D DPM codes can be read and viewed." The DataMan 9500 mobile computer was specifically designed for the factory floor. It is small and lightweight enough to fit comfortably in the hand with easy-to-use ergonomic controls. The DataMan 9500 features Cognex superior code reading capabilities and the powerful 2DMax™ algorithm. 2DMax provides the most advanced decoding available for difficult to read 2-D codes, including dot peen and laser etched, on any metal surface. The adjustable focus liquid lens maximizes the depth of field for reading barcodes. 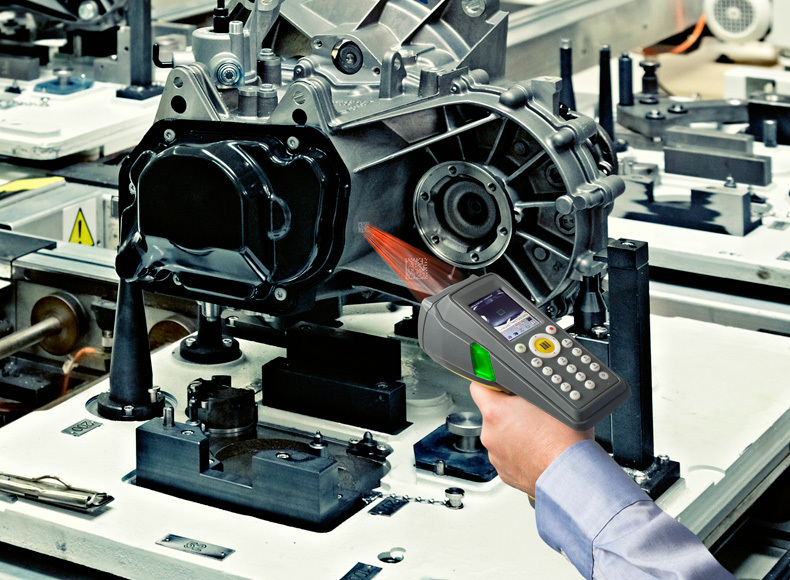 This industrially proven technology enables the DataMan 9500 to decode 2-D DPM marks close up, or 1-D barcodes from a distance. The DataMan 9500 connects directly to factory networks via 802.11 a/b/g protocols on the 2.4GHz and 5GHz bands for real-time wireless communication. The DataMan 9500 includes Internet Explorer and onboard keyboard emulation for running a web browser and HTML form based applications. It uses the Microsoft® Windows® CE 6.0 Operating System for running custom applications on the QVGA interface. In addition, the DataMan 9500 offers a Developer Toolset that provides everything needed to create custom programs. For more information about the DataMan 9500 mobile computer, visit www.cognex.com/9500.